Antonio Piceno was born and raised in southern California. His father supported a large family of seven siblings on one income in the 1930s. Antonio was the second eldest child amongst his siblings and his mother, Anita Piceno, was a stay-at-home mother. 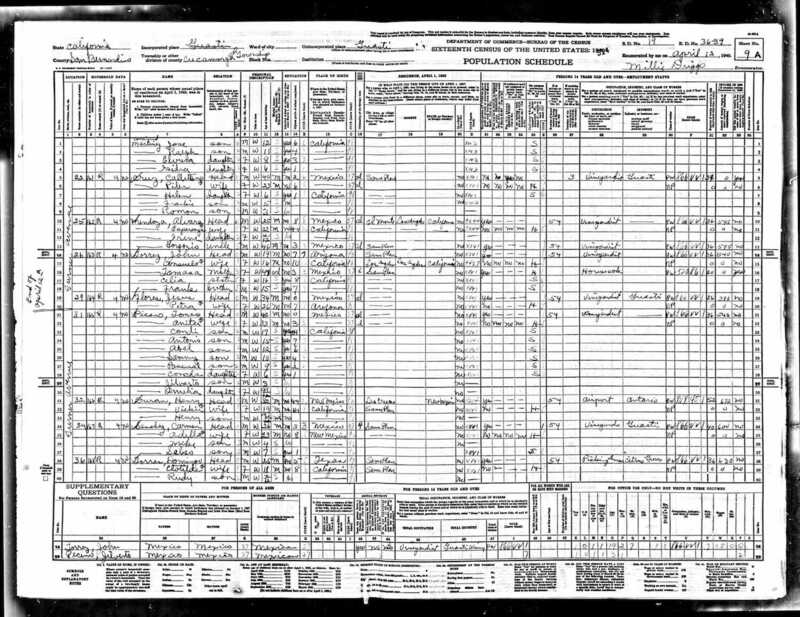 According to the 1930 census, Antonio Piceno’s father, Thomas Piceno, worked on a vineyard in the private sector. In order to become a financial supporter of his family, it is likely that Antonio ended his formal education in the seventh grade to seek employment. According to census records, both parents were non-citizen “aliens,” born in Mexico, but all of their children, Condi, Abel, Sammy, Pascual, Concha, Gilberto, Amelia, and Antonio, were all born in California. Antonio, specifically, was born in Imperial County, California. The Piceno family lived in the then-unincorporated town of Cucamonga (later to be known as Rancho Cucamonga) during the 1930s and 1940s. Antonio was drafted into the U.S. Army, at age 18. Antonio’s family was Catholic, according to his religious status listed on his headstone record. During World War II California produced war materials and trained recruits. California was home to a growing industrial center that converted consumer goods for steel, rubber, and munitions production. Kaiser Steel was located along a rail corridor that sent finished steel from California’s southern interior to the Port of Los Angeles for the construction of liberty ships. California also had numerous military installations across the state, preparing troops for combat in deserts, on beaches, and in mountain terrain. California was also home to several temporary relocation centers and Japanese Internment camps when Executive Order 9066 was enacted in February 1942. Various locations, including fairgrounds and race tracks, were utilized as temporary relocation centers for immigrants and citizens of Japanese ancestry. The internment camps of Tule Lake and Manzanar, both located in California, were two of the then evacuation camps. Seen as a precautionary measure to keep the homefront safe, this controversial piece of legislation questioned the loyalty of innocent people. Southern California was also known agriculturally for its vineyards and citrus production. Its fields were often tended to by immigrant families. The loss of Japanese laborers after Executive Order 9066, coupled with increasing economic opportunities in defense industries, caused a labor shortage in California. Immigrant laborers from Mexico were invited to fulfill the labor shortage under the Bracero Program. The region where Antonio Piceno grew up already had a large Latino population, which expanded greatly in the decades to follow. During the 1930s and 1940s, “towns” like Cucamonga, Etiwanda, and Guasti were slowly forming around this booming agricultural industry. Piceno reported for duty on September 7, 1943, exactly two years after Pearl Harbor. After enlisting Antonio Piceno became a member of the 90th Infantry Division, 357th Infantry Regiment, which was reactivated at Camp Barkeley, Texas, on March 25, 1942. Nearly all of the unit was composed of fresh recruits. Starting from scratch, Piceno’s unit learned how to fight. Rigorous training prepared soldiers for the arduous task of reclaiming enemy-occupied territory via amphibious invasion on the beaches of Normandy. During early 1943, the unit relocated from Camp Barkeley to Leesville, Louisiana, under a new commander, Lieutenant Colonel John W. Sheehy. In Louisiana, the unit engaged in combat maneuvers against the 77th Infantry Division. The 357th Infantry Regiment was returned to Camp Barkeley before heading for desert training at Camp Granite, California in September 1943. They completed training that simulated low food and water supply, night missions, stealth, and strategic coordination of planned attacks. After completing desert training, the men were sent back to Texas and ordered overseas. The 90th Infantry Division, along with Piceno, was then sent to Fort Dix, New Jersey, arriving on December 31, 1943. After additional training, on March 15, 1944, they traveled north to Camp Kilmer, New Jersey for final examinations. A few days later, on March 22, the 90th Infantry Division boarded the HMS Dominion Monarch, a British former-luxury ship converted to transport U.S. servicemen overseas. The vessel docked at Liverpool, England on April 4, 1943, and the troops were immediately moved to Kinlet Park where they were quartered. The 90th Infantry Division knew it would be some time until they saw true action. While adjusting to their new environment, speculation of when and where the main invasion would take place kept many soldiers busy. The 90thInfantry Division saw their first taste of combat in Monmouthshire, Wales when enemy planes and bombs, although not directed at them, were deployed on a camp a few miles down. From May 14 until June 3, the troops were put through usual physical training until the invasion of Normandy. Then, on June 6, 1944, the men made what is referred to as the greatest assault landing in history. Piceno boarded either the SS Explorer or the SS Bienville and landed on Utah Beach. In the days that followed, Piceno fought with his regiment through the challenging bocage terrain. On July 5, the 357th Infantry Regiment began its attack on Beau Coudray, a small town that acted as an observation post for German paratroopers. It is likely that Piceno was killed during this attack. Piceno died on July 7, 1944 when he was just 19 years old. He was awarded the Purple Heart. As a citizen of the United States, words cannot capture the level of gratitude that I have for soldiers like Antonio Piceno. Giving one’s life, not just for your fellow battle buddies or family or friends, but giving one’s life to a nation of strangers, is truly a noble cause. Each member of his family had to continue his or her life’s journey without their son or brother. Piceno’s friends likely worked alongside him as a farmhand in the agricultural fields around Cucamonga. Piceno only completed the seventh grade, but that does not tarnish who he was or his sacrifice. It was merely a reflection of the economic conditions in which he lived. As a soldier in the 357th Infantry Regiment, Piceno became part of a brotherhood that experienced intense training and preparation. While in transport across the English Channel, his thoughts likely centered around his life back in California, or on the optimistic conversations happening around him. His sacrifice was one of more than 400,000 U.S. service members that paid the ultimate sacrifice that helped secure an Allied victory during World War II. His legacy endures in the lives that present generations have today. The Silent Heroes Project is a wonderful gateway into the life of ones who have selflessly served in our U.S. Armed Forces. Too many fallen heroes have been forgotten; left to the ashes of time. A louder voice needs to be there for the individual lives that were lost so long ago. The Silent Heroes Project is that voice, projecting the stories into living history. Learning small details of not only Antonio, but of others was humbling. To realize that each of our fallen once had a beating heart and a full life to live, with people that loved them and yearned for their return, leaves a feeling of immense sorrow. Many of the lost soldiers are only seen as a statistic in wartime history, but they deserve so much more. These heroes deserve to have their stories told and their sacrifice honored. I have learned the importance of retelling these stories, even if the audience is small, it is still providing justice to the person who did so much. This project has a very didactic process. Early in the research phase, I was looking up information on basic training, unit histories, as well as the history on how the state of California contributed to the war. But then I had an emotional response when puzzling Antonio’s life together and that changed my perspective on war and sacrifice. I am grateful to have had the opportunity to learn about Antonio and to give him the opportunity to have his voice finally heard after all these years of silence. I hope to leave readers with a sense of appreciation for him and for the countless servicemen and women who have bravely gave their lives in the American wars since the country’s conception. 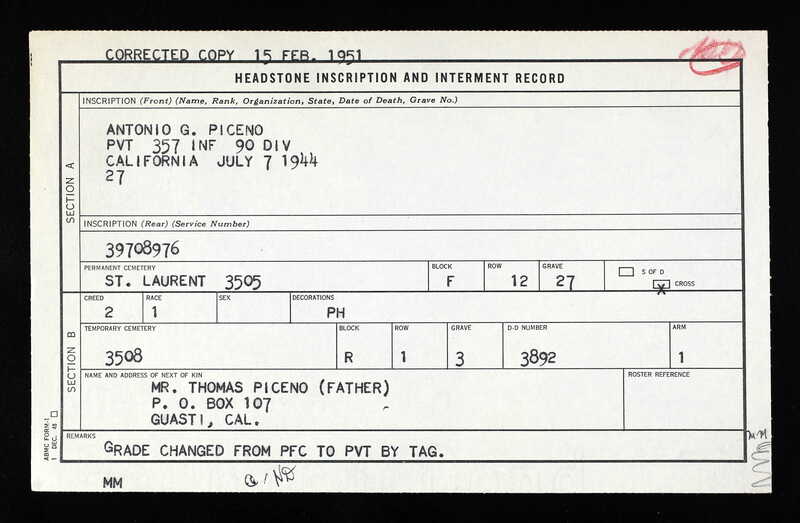 Antonio Piceno, Headstone and Interment Records for U.S. Military Cemeteries on Foreign Soil, 1942-1949. Digital Images. http://ancestry.com. California. Imperial County. California Birth Index. Digital Images. http://ancestry.com. California. San Bernardino County. 1930 U.S. Census. Digital Images. http://ancestry.com. California. San Bernardino County. 1940 U.S. Census. Digital Images. http://ancestry.com. 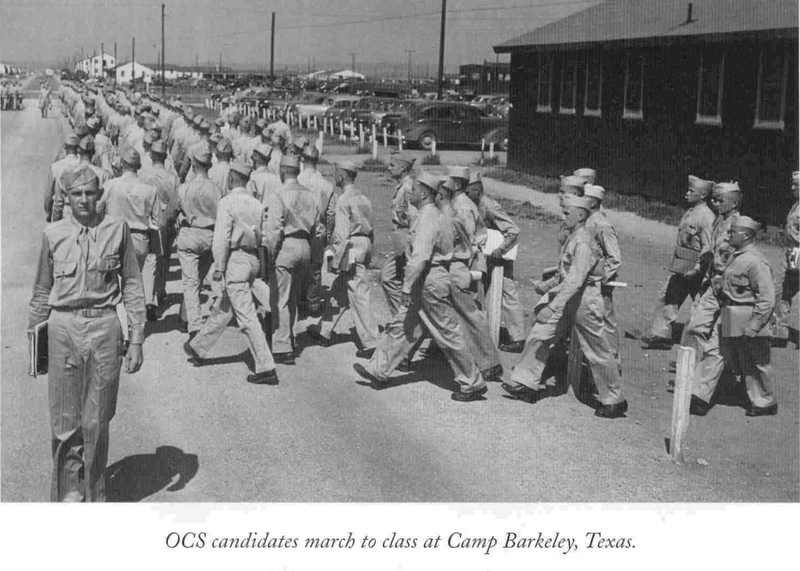 OCS candidates marching to class at Camp Barkeley, Texas. Photograph. U.S. Army Medical Department, Office of Medical History. http://history.amedd.army.mil/booksdocs/HistoryofUSArmyMSC/page130.jpg. Image. 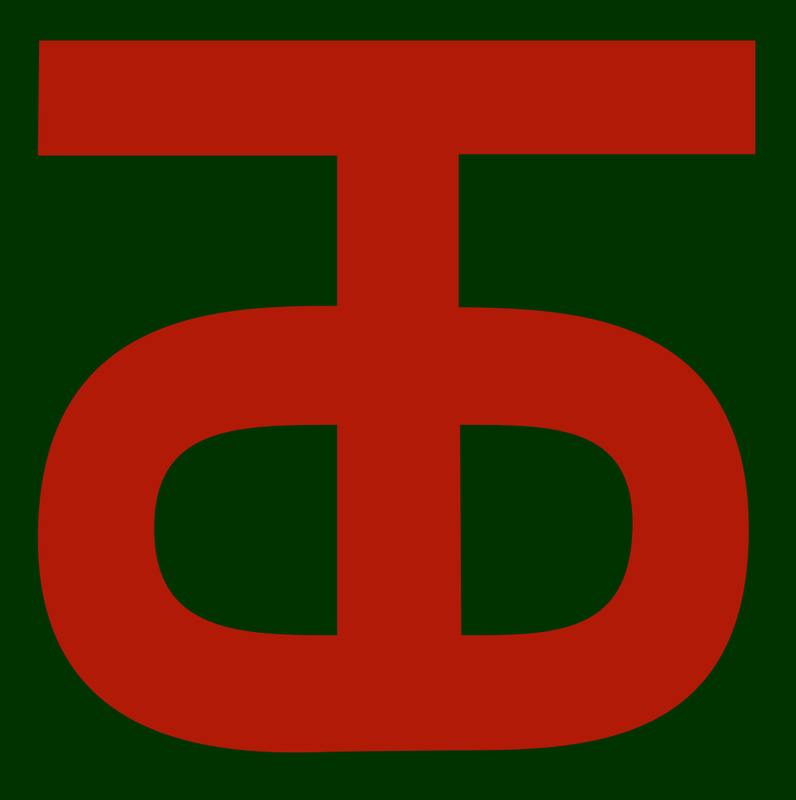 Unit insignia of the 90th Infantry Division. Wikimedia Commons. https://commons.wikimedia.org/wiki/File:90th_Infantry_Division.patch.svg. Records for Antonio Piceno; World War II Army Enlistment Records, 1938-1946 [Electronic File], Record Group 64; National Archives at College Park, College Park, MD [retrieved from the Access to Archival 2017 at http://aad.archives.gov/aad/series-description.jsp?s=3360&cat=WR26&bc=,sl, April 1, 2014]. Von Roeder, George. Regimental History of the 357th Infantry. Accessed October 19, 2017. http://www.90thdivisionassoc.org/90thDivisionFolders/357thbook/357hist.pdf. "Antonio Piceno." American Battle Monuments Commission. Accessed October 19, 2017. https://abmc.gov/node/412537#.WeipWVtSzIU. "California and the Second World War." California Military History. Accessed October 19, 2017. http://www.militarymuseum.org/HistoryWWII.html. "History of Rancho Cucamonga." City of Rancho Cucamonga, California. Accessed May 19, 2017. https://www.cityofrc.us/about/local_history/history/. "Los Angeles Metropolitan Area during World War II." California Military Museum. Accessed October 19, 2017. http://californiamilitaryhistory.org/LAWWII.html.